What are active orphan pages? Orphan pages are pages that can’t be found by users as they have no direct links on the website that are pointing to them. Active orphan pages are orphan pages that have received at least one organic visit via Google. This can happen because Google saw a link that points to your orphan page and indexed your page. This link might be an old link from your site, or it might be a link from an external site. Your site doesn't reinforce their popularity or expertise. If they're known because of an external link and that link disappears, so might all of your organic traffic to this page. With OnCrawl, you can study your orphan pages in depth and zoom in on the active ones, that is, the ones that generate SEO traffic. 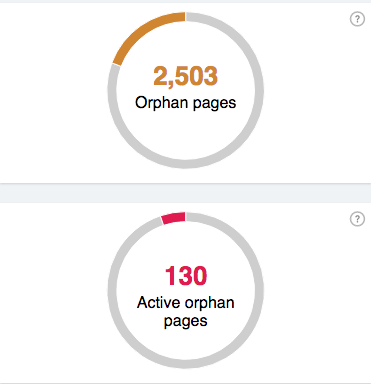 OnCrawl clearly shows how many orphan pages and active orphan pages you have. It is essential to know how many orphan pages are active, as any page that generates SEO visits can be optimised by attaching it to the website’s structure. Link all pages that generate traffic to your website’s structure (like category pages or internal search result pages). Reattach to your website's structure the active orphan pages that you have identified and that bring you the most value. Use some of your inactive orphan pages to send link juice to more active pages in order for them to rank better in the SERPs. If you have any questions about active orphan pages, feel free to drop us a line @OnCrawl_CS or click on the blue Intercom button at the bottom right of you page to chat with us.